On April 27, 1813, American forces, under General Henry Dearborn, captured the British base at York, Canada. York Ontario, which became Toronto, was located on the Northwestern shore of Lake Ontario. It was not strategically important, but was an easy target. More important there were reports that the British were building ships there. American forces were under the command of Commodore Chancey. The Americans departed Sacketts Harbor on April 25th. The American force consisted of a corvette, a brig and twelve schooners. There were 1,600-1,800 troops aboard the ships commanded by General Pike- the famous explorer. On the morning of April 27, 1812, American troops went ashore three miles from York. The Americans were lucky when the first wave of British troops arrived at the landing too late. By the time they did arrive the second wave of American troops arrived and it was too late. American troops outnumbered the British two to one. Initially, the British and their Indian allies put up a spirited defense, but the Americans were able to overpower them and push them back to York. The commanding British officer, General Roger Hale Sheaffe ordered his troops to withdraw leaving the Canadian militia alone to defend the town. The American troops rapidly advanced on the city. The American forces then regrouped under the ramparts of Yorks Western ramparts. General Pike was interrogating a British prisoner, when a massive explosion shook the garrison. The British had blown up the armory. The explosion caused a bolder to hit Pike who died soon after. American troops went on to occupy the city. Despite the fact that initially the American troops had been ordered not to loot the city, Americans troops soon looted the city and burned down government and other buildings in town. 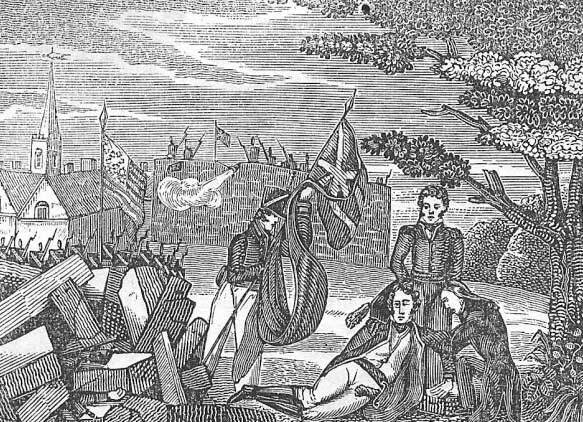 The raid on York was publically hailed as the first US victory in the ground war against Canada. In fact the failure to capture British troops intact, the fact that the British regulars had escaped and Pike had been killed tempered that victory. The Americans suffered 55 killed and 265 wounded. The British whose records of the day are a little less reliable suffered 82 killed 43 wounded, 69 wounded prisoner and 274 captured with 7 missing.